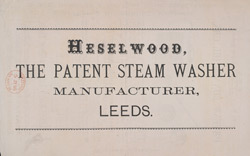 This is an advertisement for J. Heselwood, manufacturer and features the funnel oil can. In the late 19th century oil was the main source of fuel both for lighting and heating in the home and for powering industrial machinery. Interestingly there is also another leaflet in the Evanion Collection for wholesale agents Schaffer and Budenberg who are featured on this leaflet.